How to make Plantain (fried)? 2. Cut up into thick slices (lengthwise or crosswise). 4. Heat oil in frying pan for shallow frying. 5. Fry pieces until golden brown and the starch is well cooked. Test with a fork which go through easily. 6. Drain with a slotted spoon. 7. Serve warm as a snack or side dish to main course. 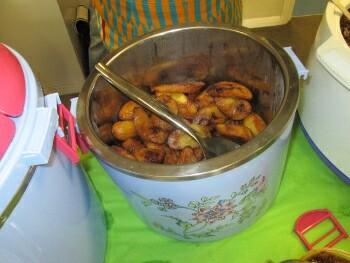 Plantain is mainly starch but contains some carotene because of the orange/yellow colour. It should be served with a protein dish.